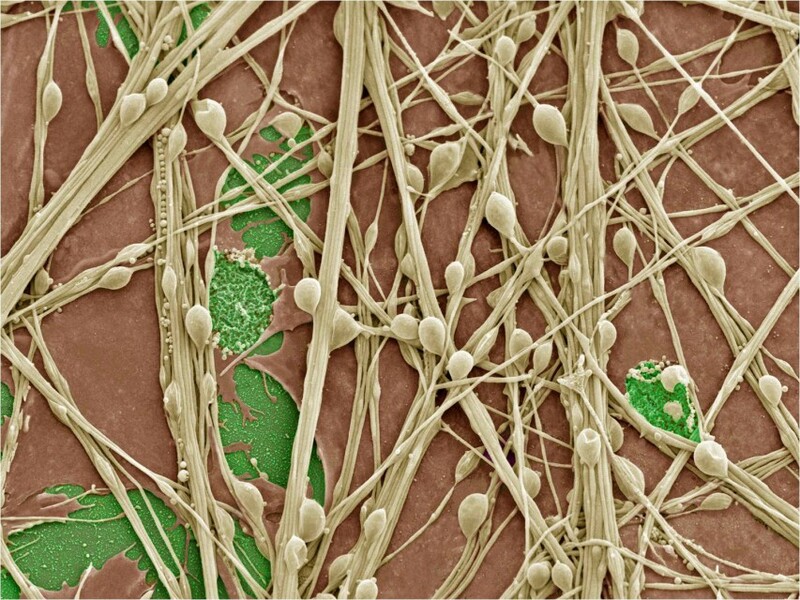 False color scanning electron micrograph of cultured human neurons and synapses. Credit: Thomas Deerinck, National Center for Microscopy and Imaging Research at UC San Diego. Four teams of scientists at UC San Diego will receive research grants from the National Institutes of Health that will help lay the groundwork for visualizing the circuits of the brain and how they work, the agency announced at a White House ceremony today. They join four other research teams at the university that in August were awarded early concept grants for brain research from the National Science Foundation. The eight awards were made to fund research projects that the two federal science agencies expect will make transformative insights into understanding how the brain works. The funding comes from each agency’s allocation for President Obama’s BRAIN Initiative, a multi-agency research effort that seeks to accelerate the development of new neurotechnologies that promise to help researchers answer fundamental questions about how the brain works. “Our success rate in winning these NIH and NSF awards is a reflection of the strength of our neuroscience faculty and the contributions they will make to this important national research effort,” said UC San Diego Chancellor Pradeep K. Khosla, who attended today’s White House ceremony and conference on the BRAIN Initiative in Washington, DC, where new federal and private sector commitments were unveiled in support of this effort. “These new tools and this deeper understanding will ultimately catalyze new treatments and cures for devastating brain disorders and diseases that are estimated by the World Health Organization to affect more than one billion people worldwide,” the agency said. David Kleinfeld, a professor of physics and neurobiology, and colleagues Martin Deschenes of Laval University, Yoav Freund of CSE and Martyn Goulding of the Salk Institute for Biological Studies will deconstruct the neuronal circuits in the brainstem that control orofacial and exploratory actions. These circuits underlie complex motor synergies, such as the coordination of breathing with tongue, jaw, larynx and neck movements that underlie vocalization. The team will exploit the advent of molecular and genetic tools to mark cells based on their lineage, phenotype, and connections and use methods from machine learning and image processing to generate anatomical wiring diagrams for the brainstem circuits. The combined anatomical, behavioral, functional and computational studies from this project will reveal the control strategy used by the brain to combine motor actions into behaviors. The award will total approximately $2.8 million for three years. John Lin, an assistant project scientist in the Department of Pharmacology within HHMI Investigator Professor Roger Tsien’s laboratory in the School of Medicine, in collaboration with Yishi Jin, professor of biology and HHMI Investigator, at UC San Diego, Mark Mayford at The Scripps Research Institute and Xin Jin at the Salk Institute for Biological Studies, will develop and test protein-based tools that can manipulate cellular events within neural synapses that are believed to mediate learning and memory. To understand how the mind works, researchers need to correlate events occurring within the brain and individual neurons to actual behaviors of model organisms or human subjects. The development of these tools, turned on and off by light, will provide neuroscientists with new ways to map the brain and observe neural functions in a minimally invasive manner. The award will total approximately $750,000 for three years. Massimo Scanziani, a professor of biology and HHMI Investigator, and Carsten Pfeffer, a postdoctoral fellow in his laboratory, will establish a classification scheme of neurons in the cerebral cortex of mammals based on the genes that best predict their function. The team will focus on the visual cortex, a part of the brain involved in processing visual stimuli. Using imaging techniques, the researchers plan to first characterize the function of individual neurons by determining the type of visual stimulus they best respond to. “The classification of neurons into distinct types is a fundamental endeavor in neuroscience,” said Scanziani. “We will then perform RNA sequencing to reveal the transcriptional profile; that is, the pool of genes that are read out of these same individual neurons. We will finally search for those genes that best predict the function of the neuron.” The award will total approximately $1.8 million for three years. Andrew Huberman, an assistant professor of neurosciences, biology and ophthalmology, in a collaborative team with labs led by Sebastian Seung of Princeton University, Markus Meister of Caltech, Rachel Wong of the University of Washington and Thomas Euler of the University of Tubingen, will define all the cell types and synaptic connections that link the eyes to the brain and probe using state-of-the-art genetic and imaging tools how those cells contribute to visual perception and behavior. “The cells that connect the eyes to the brain are actually a part of the brain. Understanding how they allow us to see and respond to the world around us would represent a major and unprecedented step in understanding how the brain works,” said Huberman. “This is a remarkable time in the history of brain science when initiatives like this one are providing labs from different universities with the opportunity to align forces around unmet goals of understanding brain structure and function. It will allow us to make rapid progress in ways that no individual team could make alone. My lab is thrilled to be among the early fleet of those the NIH and its various institutes decided to support.” The award will total approximately $4.1 million for three years.